Brookstone Files For Bankruptcy, Plans To Close Mall Stores The retailer known for massage chairs and other gadgets plans to keep its airport stores. It first filed for bankruptcy in April 2014. 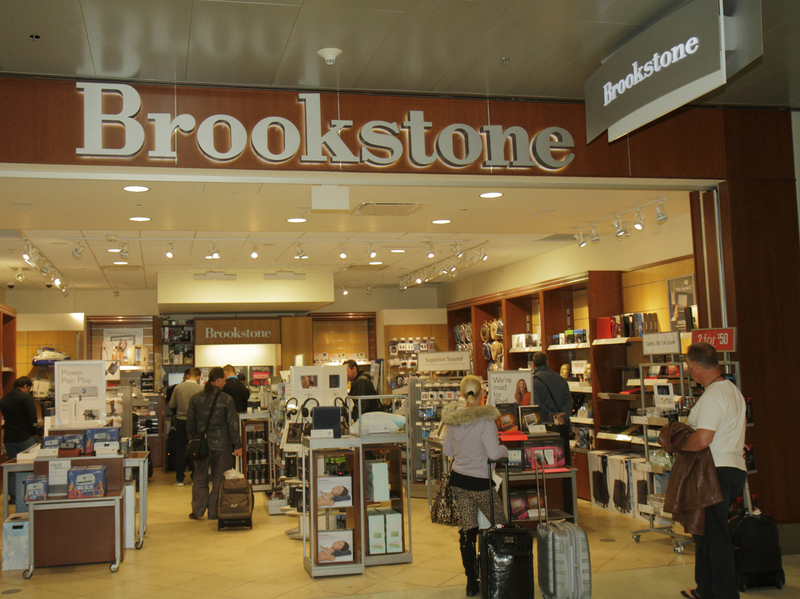 Brookstone's airport stores, like this one located in Miami International Airport, will remain open. Brookstone Co. Inc. has filed for bankruptcy for the second time. The retailer — known for massage chairs and other gadgets — announced Thursday that it will be shutting down about 100 of its mall locations with hopes of selling its remaining assets, according to the filing document. In 2014 it filed for Chapter 11 bankruptcy protection and sold its assets to the China-based conglomerate Sanpower Group. Currently, under Sanpower, the company operates a total of 137 retail stores, 35 of which are located in airports. Loss of foot traffic in shopping malls was cited by Greg Tribou, Brookstone's chief financial officer, as a major reason for filing bankruptcy. "Mall stores have operated at a loss each year consecutively since 2014 as a result of shift of consumer preferences away from brick and mortar retailers (and shopping malls in particular)," Tribou stated in the filing document. And according to the filing, the airport locations do not experience the same loss. In fact, it is just the opposite. "Consistent foot traffic, a captive consumer audience and limited seasonality has allowed these [airport] stores to thrive (on an aggregate level) in comparison to the Debtors' mall stores," Tribou said in the document. Airport locations are set to remain open for now, according to the report. According to the bankruptcy filing, the company is set to close all unprofitable stores and sell its remaining assets. The filing says the company's "technology issues and a turnover of senior level management at the e-commerce segment led to underperformance at a segment that should be performing at a significantly higher level." Employees are not happy about the news. Some only found out via twitter. Heartbroken. As an employee, I’m gonna miss my coworkers. "Heartbroken. As an employee, I'm gonna miss my coworkers," Reneé Larson tweeted. "Nice job letting employees know on social media instead of in person," Jessiah Ramon tweeted. The company hopes to complete sale of the business before the end of September.